There are hundreds of casinos where players can enjoy casino action online. However, not all of them are created equally. 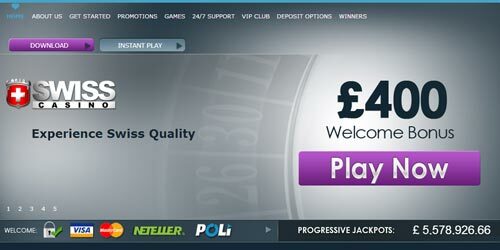 It is important for players to find a casino that has good customer service, lots of games to choose from and good software that is bug-free. Players will find all these things at Swiss Casino. Here is a look at everything this casino has to offer its players. The most important thing that players want from their online casino gamble action is a wide variety games from which to choose. Swiss Casino doesn’t disappoint in this aspect. There are more than 80 games available for players to enjoy, including lots of slot machine offerings as well as video poker. They have all the classic table games like roulette, craps, blackjack and baccarat. One of the most impressive aspects of the experience at this casino is that they have live dealer versions of all of their table games. This means that they show a video feed of an actual dealer spinning the roulette wheel or dealing out the hands of blackjack. This is a great way to make the action more exciting, and it is reason enough for many players to try the action here. There are lots of great bonuses available as well. As long as players deposit a minimum of $50, they will receive a bonus of 10 to 20 percent on their initial deposits. There are also always bonus promotions going on, including generous reload bonuses for loyal players. The customer service is very good. They are available 24 hours a day to answer any question that players have. Customers can reach their customer service agents through the telephone, email or live chat. All options offer quick responses, and the agents seem sincerely committed to helping players with any difficulties they encounter. The software is one area where this casino could use a little work. The software is reliable and does not have any bugs, but it does not offer stunning graphics. The games are all enjoyable and certainly function very well, but there are no eye-catching graphics that will make players sit up and take notice. The overall experience at Swiss Casino is very good. They have lots of fun games and they do a top-notch job of customer service. Their live dealer games are particularly exciting, and every player should give them a try.